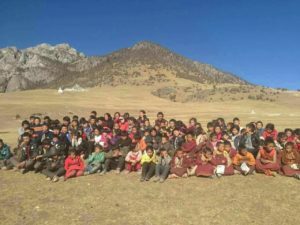 Wool-Aid is very happy to support children at the Duo Duo Monastery in Tibet—both young monks and children who are cared for by the monastery, which includes children who were orphaned as a result of the 2010 earthquake and children of neighboring nomads. The Duo Duo Monastery is located 4000 meters above sea level, an altitude which means that winter there lasts from September into May, with temperatures well below freezing! Colors appropriate for the young monks in Tibet are maroon, brown, and gold. Blankets, however, can be in other colors, and even multi-colored. Items for the other children in the care of the monastery can be in any color. Wool-Aid is able to ship to the Duo Duo Monastery year-round, so we’ll be sending a lot of warm sweaters, vests, hats, socks, mittens, and blankets to these youngsters to keep them warm! In 2017, we renewed Wool-Aid support for young monks and elders at the Kyegu Monastery in Gamrau, India. These young monks are boys of Tibetan background who are living at a branch of the Kyegu Monastery in India, about 9 hours drive north of Delhi, that was founded in 1965 by Tibetan refugees who fled Kyegu. There are now 32 young monks ages 7 to 17 living there (up from 19 a few years ago), plus 6 elders. Winter weather in Gamrau is severe, and this group has always struggled to stay warm. Colors appropriate for the young monks in Gamrau are maroon, red, brown, and gold. Blankets can be in other colors, and even multi-colored. 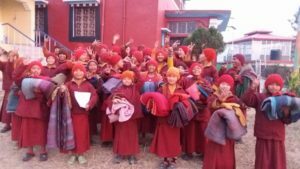 These young monks are happy with their new, warm blankets and clothing. They will be much warmer thanks to Wool-Aid! This totals 5003 items shipped out in 2017. Our large winter shipments have rolled over into 2018 for those organizations that can receive and distribute our items throughout the winter, including Syria Relief and the Duo Duo Monastery.